One of the most difficult areas in the garden to find plants for. There are plenty of plants that grow well in dry conditions but they tend to be sun lovers, and there are quite a few that can put up with shade if there's moisture available. For dry shade though, in the lee and shadow of a wall or fence or beneath a tree or hedge there are far fewer options. Firstly be realistic. If your dry shade is beneath a large evergreen such as yew, then virtually nothing is going to grow there. It will be shady all year round and as well as the branches and leaves intercepting the rain and channeling it to the trunk, there will be strongly competitive roots just below the soil surface to contend with. It's therefore a question of trial and error to some degree. If you can't get plants to grow as close to the area that you would like (up against a hedge bottom for instance), then try coming just a little bit further away. If the area has proven particularly difficult in the past try just one or two plants at different distances rather than consigning lots of them to certain death early on. If things still don't grow, then it may be time to withdraw gracefully - as a rule of thumb if grass or weeds won't grow very well in a particular area, then something prettier and more ornamental almost certainly won't! Another approach could be to grow taller plants a little further away from the wall, tree, hedge etc. so that you don't see the bare area behind them so easily. However, lets not give up before we've started, these are some plants that have more than a sporting chance. You can help them along by enriching the soil at planting time with plenty of organic matter for moisture retention, and applying a mulch later on when they're growing well. 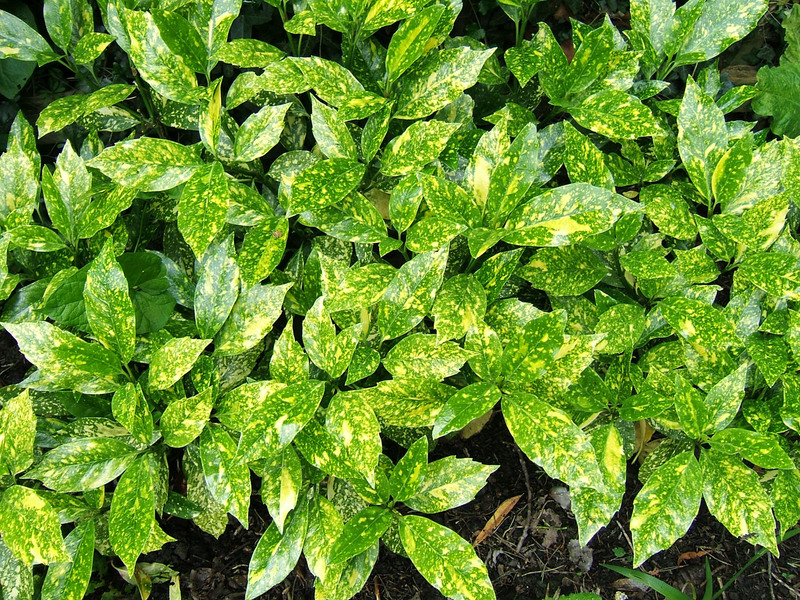 Evergreen shrub, with glossy leaves to 8" long spotted yellow. 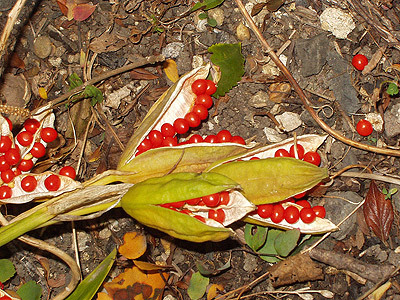 Plants are either male or female, females have bright red berries in autumn. Tolerant of quite deep shade and indeed requires some shade to be really happy. Will grow in difficult situations and tolerant of dry soil. To about 10ft high and wide but easily controlled and fairly slow growing. 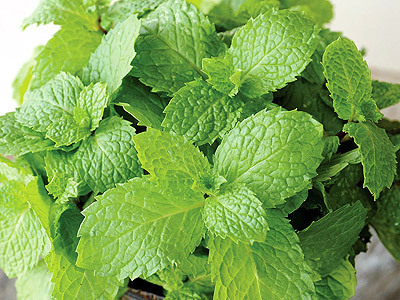 Frequently sold as three or four rooted cuttings in a pot, separate them and you instantly have more plants! A spreading herbaceous perennial. Eloquently described by my granddad as a plant that "grows like a bugger" It has a habit of spreading into every nook and cranny once it gets going. The customary advice is to plant it in a bottomless bucket sunk into the ground. Used in a difficult spot, the enthusiasm will be somewhat curtailed. If it goes where you don't want just pull it up and use it in sauces, drinks etc. Cut the plants down to 10-15cm above ground level in late autumn. What does a poor plant do to deserve such awful names? A member of the iris family, though the flowers are easily overlooked. 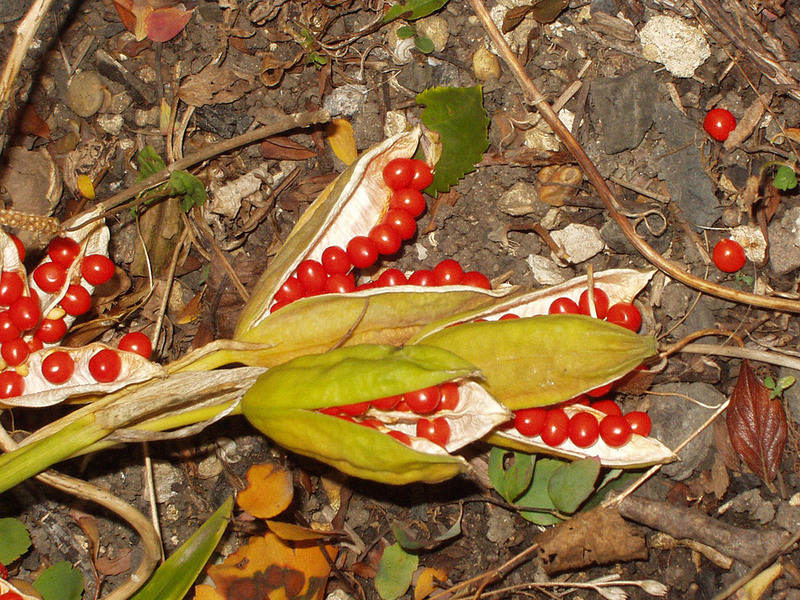 It produces very attractive bright orange seeds in large number that shine in the autumn when the pods split open, and it is very tolerant of dry shade. A natural woodland plant, so one that is used to shaded and dry conditions. Dark green leaves and tall clusters of long lasting, almost luminous lime-green flowers in spring. Can become invasive if ignored and allowed to be, but easy to control as long as you don't forget about it. 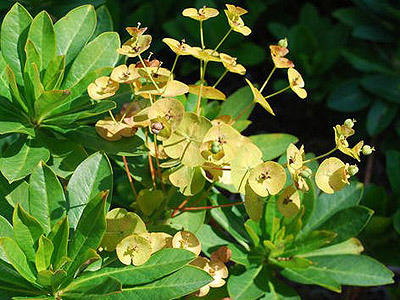 Like all Euphorbias has irritant sap, so wear gloves and take care if cutting it. A group that spans very pretty plants with lovely variegated foliage to ones that are not far short of looking like weeds. Difficult to give recommendations, because difficult conditions often make good looking plants appear weedy, the best bet is to try one and see if still looks good when up against the odds. The darker the green of the plant, the more chlorophyll and so the more likely it is to withstand shade, don't bother trying the almost completely white types in anything but full sun. 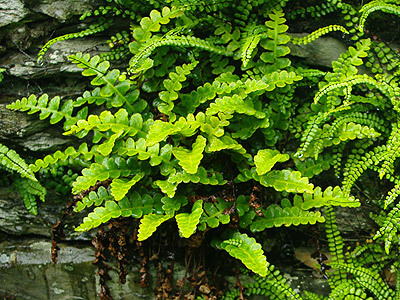 We think of ferns generally as plants for damp places, and so many are, but some groups, in particular, the polypodies are resistant to drought conditions. This one can be grown on the ground or even naturalised in trees or walls to give a tropical look to the garden. Like many plants for dry shade, it will spread if allowed to and so needs to be kept in check if it's very happy where you plant it. Variegated ground cover plant with blue spring / summer flowers. Vinca major will grow to about 20" tall, spread indefinite, roots as it goes. Very tough once established, and tolerates sun or shade. 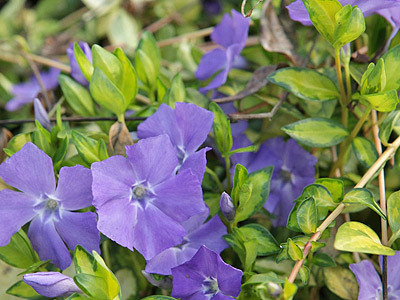 Vinca minor is equally unfazed by novice gardeners or shade, will confine itself to about 8" and a much reduced spread. The deeper the shade, the more likely variegated leaves will revert to plain green and the less flowers you will get. 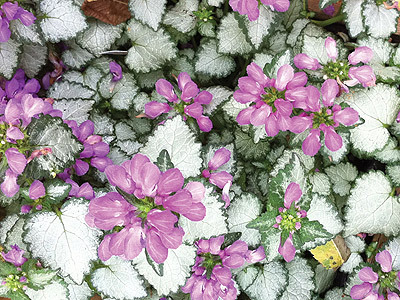 A very useful ground cover plant with unusual leaves tinted with bronze-red when they open and turning a beautiful shade of reddish-brown in autumn. 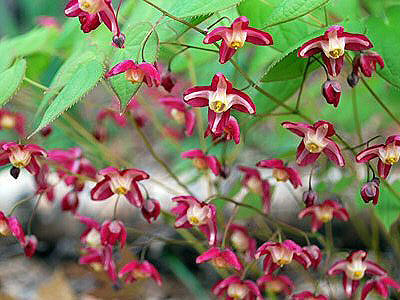 Tiny flowers are suspended on thin wiry stem above the leaves in the spring. Spreads, but does so slowly and copes well in the dry shade underneath tree and shrubs. I have grown these in and amongst mint in the least promising of all conditions and they have performed admirably. The leaves are a fresh green and the plants produce tiny white flowers and tiny strawberries. Don't think that these will get you through Wimbledon week in traditional style however, difficult conditions mean that there's little energy to spare for such fripperies. 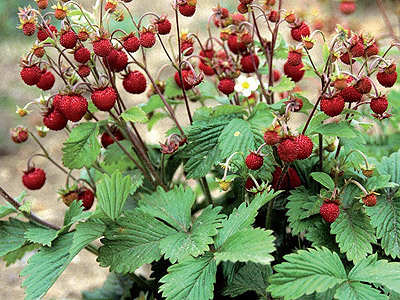 Wild strawberries also have the advantage that they root as they go by runners so they find their own preferred place if you plant them a bit too close to the gruesome places. Many of the trees providing summer gloom admit plenty of light in winter assuming they are deciduous and not evergreen. 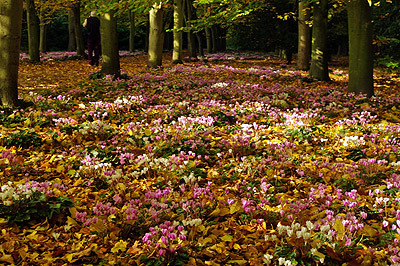 The opportunity should be seized for under planting them with winter and early spring-flowering bulbs. These can provide a sheet of colour in their season but complete their growing in time to be at rest once more when the shade thickens. 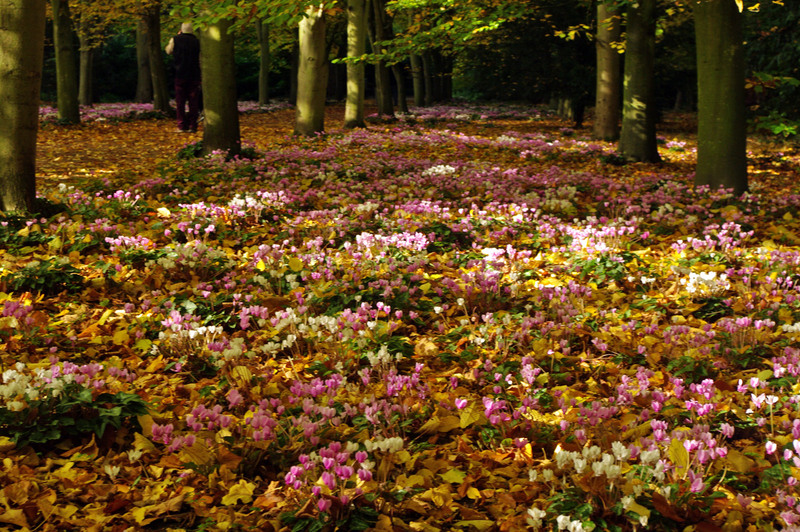 The autumn-flowering Cyclamen hederifolium will oblige, with its pink or white flowers. The foliage, a great asset in itself with its different shades of green, will not develop until late autumn and will be at its best through to April; then it withers quite naturally. 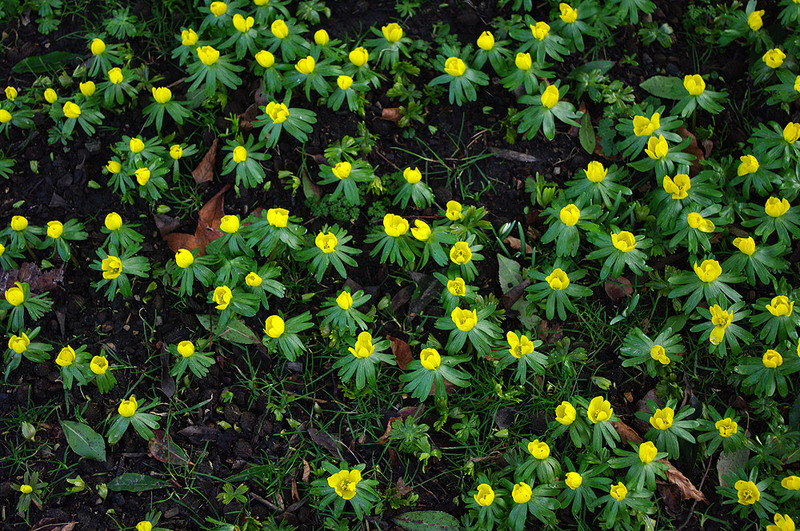 In January, winter aconites, Eranthis hyemalis, will flower in sheets - cupped yellow blooms surrounded by a ruff of leaves. If they take to you, they will spread with their own seedlings. (for me, they have always been an abysmal failure.) These can be joined, in February, by another great self-sower, the little mauve Crocus tommasinianus. Tiny daffodils such as Narcissus cyclamineus and the hoop-petticoat, Narcissus bulbocodium are good as are blue Scilla siberica and Chionodoxa sardensis , none of them dying with obtrusive foliage. Spanish bluebells, on the other hand, so common in London gardens, die down very messily in May, but you might think them worth it for their April display. In summer there is a place for dignified bareness if all else fails, keep it tidy and not scruffy so it looks like a definite decision rather than having ended up like that because you can't do any different.